(NEW ALBANY, Ind. )–There was always something on the wind for Jean Abshire. Something that called her to distant shores, peoples, languages, ways of thought. She responded to that call, visiting more than three dozen countries and devoting her career to helping students explore and understand the world beyond the borders of their hometowns and the boundaries of their imagination. As associate professor of political science and international studies, and coordinator of the international studies program, Abshire has remained true to a set of core themes that anchor an ever-evolving panoply of classroom innovations to personalize content and inspire students to play a more critical, informed and active role in the world they inhabit. At the center of Abshire’s approach lie three themes: power, global citizenship and life skills. The first is power, the study of which is the raison d’etre of the discipline of political science. Abshire seeks to imbue students with the reflex to locate the power in any political system, no matter how alien. But she goes beyond this obvious presence, to sensitize them to the more subtle workings of power in the world around them. That global understanding is partly pragmatic: how do events transpiring in the world affect us? “I hope that they will come to develop an understanding of the international forces shaping their lives, because that’s very real,” Abshire said, citing rotting soybeans and rising construction costs as two examples of the impact of tariffs on the local economy. But global citizenship also means learning about how small individual acts add up to movements that change lives and history. “Power is everywhere”–Dr. Jean Abshire (r) and colleague Dr. Cliff Staten dissect global affairs during the International Power Hour on Horizon Radio. For Abshire, making choices from a place of global awareness matters because the interconnectedness of diverse peoples is a fact. This is where the classroom and the real world merge, and what is taught in a political science course becomes a skill for navigating life. Over the years, Abshire has cultivated a long list of activities that make her classroom a laboratory of innovation. And as her focus is the first year seminar, Abshire leverages her innovations where they can be most effective for the student, and for the university. By including high-impact practices (HIPs) known to enrich the learning experience, Abshire is helping the campus retain students at a critical juncture in their college careers. For the retention of students from the freshman to the sophomore years is a critical challenge at colleges across the U.S. By bringing her three core themes to bear in the very first year, Abshire fosters a curiosity that makes the subject matter relevant to each student. Personalizing the global is the leitmotif of Abshire’s classroom technique. Whether by bringing in snacks from Asia or fostering study abroad opportunities, she is unstinting in her efforts to blow minds through exposure to the new, the unfamiliar, the faraway. For example, Abshire has long used simulations of various kinds to stimulate active learning. Now she is introducing modules from the Reacting To The Past (RTTP) community to place students in the midst of touchy international events, such as the transition from apartheid in South Africa in 1993, and the partition of India in 1947. In a similar vein, Abshire has also incorporated scaled-down Model United Nations simulations in her classes to give students not just information, but agency. The Courageous Choices Fair is a relatively new activity. Abshire assigns each student an individual who has made a difference in politics and society. The students research the figure, and create a poster presentation illustrating what they have learned. For the freshmen, it’s a chance to cut through the dry slog of textbooks and focus on a compelling person not so different perhaps in age in spirit from themselves. Their research finds its way into poster presentations that are then displayed to the public at the Fair, where the students make themselves available to interpret their posters for visitors—consider it a mini-student research conference with a human rights bent. The students’ enthusiasm and affection for these figures is palpable, as is the expertise they reveal in their preparations. Most importantly, they have formed a connection that embodies the unifying themes of power, global citizenship and, broadly, life skills. Abshire’s latest push into new frontiers isn’t terrestrial, but virtual. 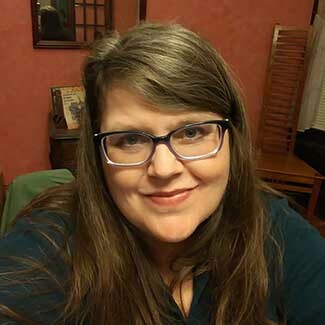 She has begun a facebook group called Abshire’s Alcove, a community where participants discuss current events and trends from around the world. The format enables group members to share stories from media sources, and generate instant conversations on just about anything–Russian electoral interference, plastics in the ocean, the impeachment of the Somali president, you name it. The page—not connected to a course—leverages the spirit of social media (at its best) to create a convergence of informed and empowered global citizenship. Perhaps Abshire’s most consequential innovation doesn’t take place in the classroom at all, but knocks down the walls that traditionally separate it from the world. It’s the International Power Hour on Horizon Radio, a weekly blast of discussion of and commentary on current world events that brings together Abshire with longtime colleague Cliff Staten, professor of political science. 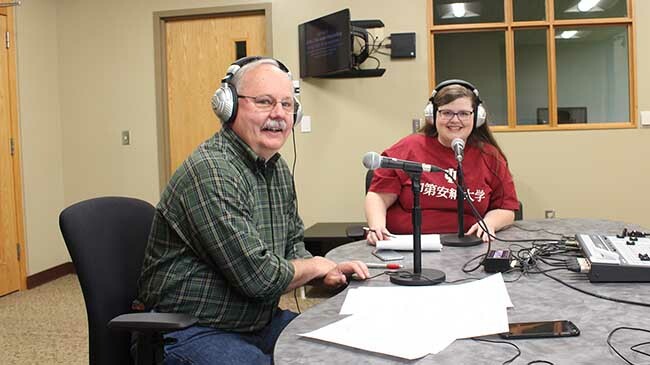 The two hosts endeavor to bring the issues home to IU Southeast—to not only provide background and context for breaking stories such as Brexit, the North Korean nuclear standoff and tariffs, but to show how these events affect our region. One evening, when Abshire was a child, her father sat down at the dinner table and announced that Portland, Oregon, where the family lived, was now on the list of targets for Soviet intercontinental ballistic missiles. Recalling the moment now, Abshire remarks on its utter normalcy. There was no panic, no frantic search for shovels or road maps, but a matter-of-fact mulling of causes and implications. Then on to another topic. From her earliest days, Abshire experienced the world, not as the duality of us and them, but as a pageant of peoples too interesting—and perhaps even existentially important—to ignore. Her Fulbright years in Germany and Austria, and her research into conflict driven by ethnic nationalism, stamped her as a citizen of the world, committed to overcoming delusion and division through diversity, compassion and courage. Her classroom today is the ICBM on the dinner table: the world as it is.